Rediscovering baseball cards and players from the past. The 1991 Topps set was an attempt to be a little bit more minimalist and refined with its design, which was the trend in the early 90’s. An anniversary emblem adorned the front and back of every card, but other than that, it was just another very mediocre Topps set. Topps’ photography was getting a little better, but the higher quality poses and images in other premium sets made Topps look amateurish and boring. I’m not sure if it was the photography or a limitation of the card stock used by Topps, but pretty much all of their photos suffered from a strange blurriness that made it look like there was a matte painting behind the players. Very tall and skinny. Who is shaped like that? There hasn’t been a successful hitter shaped like that since Ted Williams, and I don’t think there will be again. Hayes may be the last of his kind. He also looked a bit like Carl Sagan. 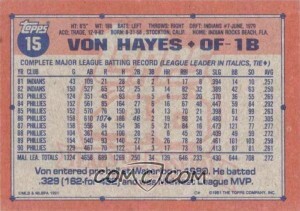 Hayes spent only two years in the minors, hitting very well in A-ball and AAA before breaking in with the Indians in 1981 at the age of 22. Hayes was originally acquired by the Phillies in a “five-for-one” trade with the Indians in exchange for Manny Trillo, George Vukovich, Jay Baller, Jerry Willard, and Julio Franco. 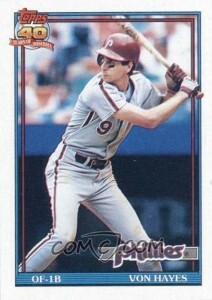 The bulk of his career was with Philadelphia, where played offensive sidekick to Mike Schmidt. When he first came up, Hayes was nothing special at the plate, but something he learned to do quite well as he got older was draw walks. In the statistically ignorant 80’s, that ability to get on base was probably overlooked and undervalued. These days, a look at the numbers reveals that he was quite good with the bat in the late 80’s, though a mediocre first baseman. 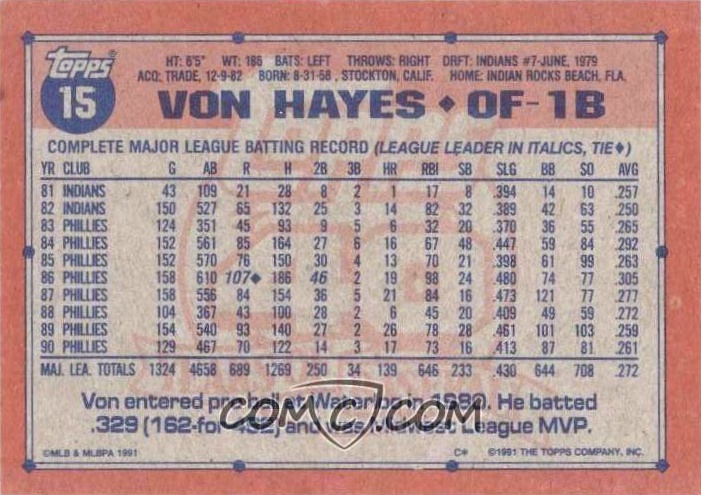 On June 11, 1985, Von Hayes became the first player in MLB history to hit two home runs in the first inning of a baseball game. Hayes was unpopular with fans. His cool demeanor on the field, coupled with rumors of a prickly personality off the field, rubbed people the wrong way. He also never quite lived up to the expectations that came with being traded for five players. I broke my arm when I was hit by a pitch from Tom Browning… and I was finished. I tried to make a comeback (with California) in 1992, but it was no good. I never realized he stole so many bases, averaging about 25 a year and reaching a high of 48 in 1984. I would have loved to see him run. I imagine he would have looked like a baby deer. Since retiring, Hayes has managed a variety of minor league teams, currently the Alexandria (Louisiana) Aces.